Grab yourself this handy kit complete with quality air mattress and handy 12v pump designed to inflate and deflate! There is nothing worse than waking in the middle of the night on a deflated air bed. Most common cause of punchers is over-inflation. An air bed that has been pumped up until it is very hard will have a lot of pressure on the seams especially when 1 or 2 people lay on it. An air bed should only be inflated to a point where you can push down in the middle of the bed and nearly touch the ground, while this sounds like it would not be firm enough, by the time one or two people lie on it, it is very comfortable. The air inside the bed can expand and contract with changes in the temperature. So if you have pumped your bed very hard and then leave it in a hot tent all the increase in pressure from expanding air, can be enough to split a seam. This can also explain why a bed seems to go down a little at night, as the cold air contracting thereby reducing the pressure inside the bed so you may need to add some air. 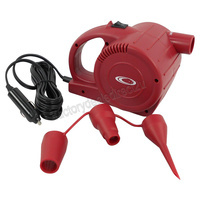 Outdoor Connection's Breezeway air pump is a must have for your next trip. 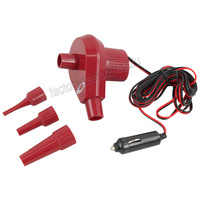 It is a lightweight 12v portable air mattress pump, will pump a queen air mattress in approx. 3 Minutes. Add us to your favourites, as new listings are added daily!